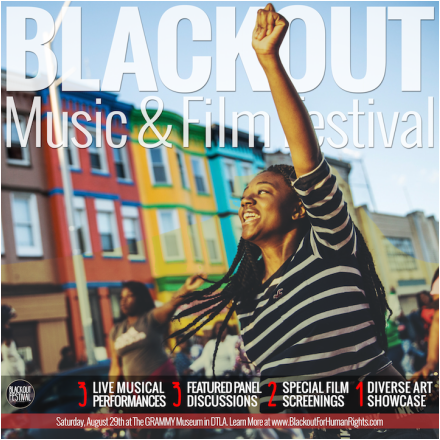 Hosted by Blackout for Human Rights, Blackout Music & Film Festival Will Take Place on Saturday, August 29th at the Historic GRAMMY Museum in Downtown Los Angeles Located at 800 W Olympic Blvd, Los Angeles, CA 90015. Doors Open From 12 PM to 10 PM. Blackout for Human Rights is a network of filmmakers, artists, activists, musicians, lawyers, religious leaders and concerned citizens who commit their energy and resources to immediately address the staggering level of human rights violations and injustices against fellow Americans throughout the United States. Blackout is comprised of both high visibility and everyday citizens. Some notable members include Ryan Coogler, Michael B. Jordan, Charles King, Nate Parker, Donald “Childish Gambino” Glover, Ava DuVernay, Jesse Williams, John Burris, Joseph Gordon-Levitt, Rosa Clemente, Shaka King, Scott Budnick, David Oyelowo, and Pastor Michael McBride.